“God doesn’t call the qualified; he qualifies the called,” is a quote I see frequently. Each of today’s readings has someone being called to do something for which they feel unworthy. Rarely do three readings align so well as these three do. 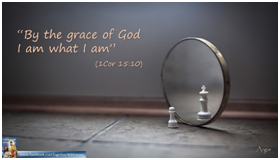 While usually Peter is my guy – the one whose actions and words speak to me most poignantly – today, it is Paul’s words that resonate: “By the grace of God I am what I am” and who he was, as who we all are, is who God calls. Make no mistake – we are all being called. I have been a catechist for almost 30 years. During that time, I have responded to many calls, not always willingly, sad to say. Other times, I have done the ‘calling.’ When initially approached for ministry, most respond: “Me? No way. I am not holy enough, worthy enough, don’t know enough. I can’t do that.” Neither am I holy enough, worthy enough, know enough. And yet here I am, 30 years in. By the grace of God, we are all who we are, and in the eyes of the God who created us, it is enough. Would that we thought the same. As part of the Body of Christ, all have a role. Paul, in another letter to the Corinthians, notes that just as the ear can’t do what the foot does, nor the eye what the mouth does, each member of the Body of Christ does what only she/ he will do – a task left undone if we don’t do it. This can burden us with anxiety … or arrogance … but doesn’t change the fact. Since God calls us to it, God will qualify us to do it. God asks of us only what God knows we can, through his grace, accomplish. Years ago, a visiting priest said in his homily: “God doesn’t ask us to be successful, God simply asks us to do.” A consoling sentiment then, I have thought of it often since. Thank God, God doesn’t ask us to be successful, because often I have not been particularly successful – if I look at success as I understand that word.